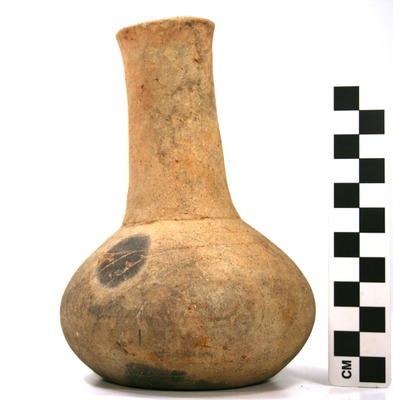 "41UR315, Burial 27, Vessel 138" by Timothy K. Perttula and Robert Z. Selden Jr.
DECORATION (INCLUDING MOTIF AND ELEMENTS WHEN APPARENT): Defined by two upper and lower horizontal engraved lines, the vessel body has a circle and scroll motif repeated three times around the vessel. The central circle element is comprised of three increasingly larger concentric circles, the second of which has pendant triangles on it. The outermost circle is connected to the continuous scroll engraved line. The upper and lower scroll fill zones are triangles (one or two) with small open or excised triangles within; the larger triangles in the scroll fill zones have inward-pointing pendant triangles, while the smaller triangles have tick marks on them. Ripley Engraved, var. unspecified bottle, Vessel 138, Burial 27.